Bhubaneswar: An additional 42 of 108 ambulances were added to the fleet of 108 Emergency Medical Ambulance Service in Odisha with the flagging off the ambulances by Health and Family Welfare Minister Pratap Jena today. The 108 Emergency Medical Ambulance Service was launched in the State on March 5, 2013, and presently is operated with a fleet of 470 vehicles covering all 30 districts, providing emergency medical service free of cost to the people. The fleet has 414 ‘Basic Life Support’ (BLS) and 56 ‘Advanced Life Support’ (ALS) ambulances. In addition to the 108 Ambulance Service, the State has in position a fleet of 500 ambulances under 102 Ambulance Service for transportation of pregnant mothers and sick infants. Till date, over 38 lakh people of the State have been benefited from the ambulance service. Official sources said the intervention has been instrumental in significant reductions in both the Infant Mortality Rate (IMR) and the Maternal Mortality Ratio (MMR) in the State. Mr Jena said the state government from its own resources have made provision for additional 92 Ambulances under the 108 fleet to further improve the performance of Emergency Ambulance Service in the State, particularly in tribal districts, and to meet the increasing demand for this service. The state government has also provided for up gradation of 28 BLS ambulances to Advanced Life Support (ALS) ambulances, out of the State fund, to strengthen the existing ambulance fleet. The government has made a budgetary provision of Rs 90 crores (over a period of five years) for these additional ambulances. Chief Minister Naveen Patnaik has dedicated 92 additional ambulances to the people of the State on December 23 last year and flagged off 24 ambulances on December 23 last year. 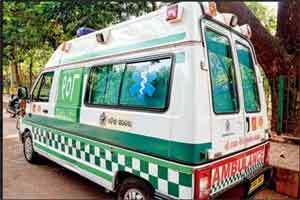 The Health Minister flagged off 26 ambulances on July 12 this year and the rest 42 ambulances were flagged off today.